"No one in her time could resist Emma Hamilton, and nor will you​"
You'll be £12.99 closer to your next £10.00 credit when you purchase That Hamilton Woman. What's this? Emma Hamilton, much maligned by her contemporaries and later by historians and commentators, rose from the most humble beginnings to play a startling role in Britain’s naval victory over France and Spain in 1805. In this new book Barry Gough, employing the letters between the protagonists, and the unpublished examination of her career by famed American historian of the Royal Navy Arthur Marder, strongly defends Emma. He shows how this most talented of women and the beauty of her age fell victim to innuendo, slander and cruel caricature. She was to die in poverty in Calais in 1815, just months before Napoleon’s final defeat. England’s greatest sailor fell deeply in love with Emma in the years before Trafalgar. This, together with his quest for glory and victory entangled him in an inescapable web of circumstances and calumny. The author explores the evolving scandal, the high political stakes that were involved, and the love affair itself which so influenced the fortunes of England’s glory and the fate of her Wooden Walls. No novelist could have created such a tortuous scenario, charged as it was with high emotions, slurs, insults and slander. Richly illustrated throughout, the book shows Emma, probably the most painted woman of her age, in all her glories; it also shows how heartlessly caricaturists treated her. ‘That Hamilton woman’ will long remain a controversial figure but here the author places her as one of the forces that gave the Royal Navy its will to fight and conquer. He depicts sympathetically a woman entrapped in circumstances of her own making, her saga reminding us of how frail is human fortune. This attractive little book makes a handy companion to the current exhibition at the National Maritime Museum. 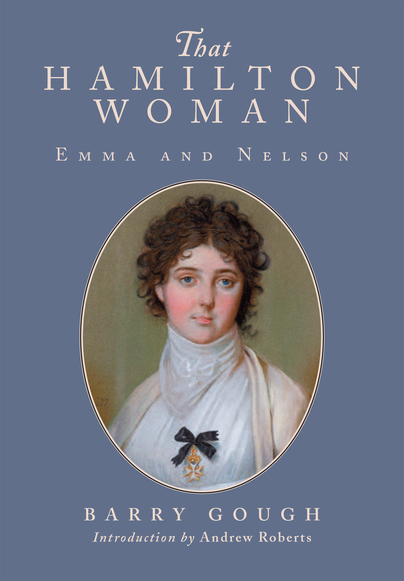 This book will appeal to people wanting an overview of Emma Hamilton’s life and her relationship with Nelson. It ought to serve well as a companion to the National Maritime Museum’s special exhibition, Emma Hamilton: Seduction and celebrity. An excellent little book and beautifully illustrated... There is a considerable body of literature about Emma, and That Hamilton Woman is set to join the best. I was personally drawn to this story because Nelson's great nephew, Major General Horatio Nelson Davies' wife's brother was one of my great great grandfathers, and Charles Greville is my 5 greats uncle. I also have a modern (and I think fairly crude) mezzotint of Romney's depiction of Emma Hamilton at her spinning wheel. However I would also recommend this book – romance, adventure story, political history - to any general reader with an interest in Lord Nelson. Even with Southey and Oman and other biographies of him on my shelves already it is still a case of semper aliquod novi ex Nelson. Admiral Horatio Lord Nelson fell in love with Emma Hamilton in the years before Trafalgar. This romance, together with his quest for glory and victory, made him the talk of the age. The author explores the evolving scandal, the high political stakes that were involved, and the love affair itself – which influenced not just their lives, but England’s destiny. Gough draws on the letters between the protagonists and in particular the findings of the historian of the Royal Navy Arthur Marder. This is a nicely balanced review with a sympathetic hand that the heroin deserves. A particular delight is provided by a fine selection of paintings and cartoons, mostly in full colour. These can be enjoyed as art, but they also directly support the author’s presentation of the story.